The 25 metre sportfish motor yacht Cajun Dancer, listed for sale by Galati Yacht Sales, has been sold with Mike McCarthy at HMY Yacht Sales introducing the buyer. Built in GRP by US yard Viking, Cajun Dancer was delivered in 2012 as a Viking 82 model sporting what the builder proudly calls an ‘American flag blue’ hull. Accommodation is for eight guests in four cabins consisting of a master suite, VIP suite, double and twin cabin, all with entertainment centres, flatscreen LCD televisions and en-suite bathroom facilities. In addition, two crew are accommodated in a twin cabin. The saloon has teak cabinetry, L-shaped seating, an ice maker, cocktail cabinet and an entertainment centre including a 55-inch LCD television screen and a Bose surround sound stereo system. Up in the enclosed flybridge is a Stidd helm chair, port and starboard seating, a couch on a raised plinth and a 37-inch flatscreen television set. The custom Bausch aluminium tower comes with a full electronics package and bow thruster controls. The cockpit has a fighting chair, bait boxes, rod holders and all the gear needed for an exciting day of big game fishing. Twin 2,600hp MTU engines give her a cruising speed of 30 knots and have extended warranties until July 2017. 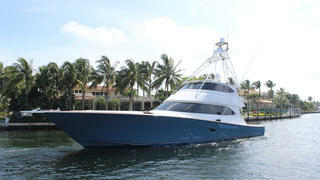 Lying in Ocean Reef, Florida, Cajun Dancer was asking $5,595,000.